I hope you saved at least a cup of your roasted pumpkin seeds from yesterday’s recipe because we have an amazing trail mix for you that is the perfect balance of sweet and salty. Throw in whatever you want or leave out what you don’t like, that’s the beauty of trail mixes. Plus they are quick and easy snacks to take along with you right in your purse. Take it along with you as a healthy snack while taking your kids Trick or Treating. It will curb your urge to reach for their Halloween candy. Preheat oven to 375 degrees. Toss the almonds with coconut oil and spread on a large baking sheet. 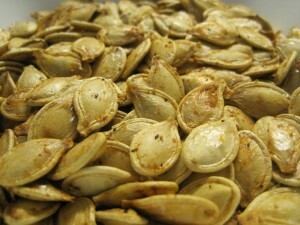 *If you haven’t already roasted your pumpkin seeds, you can add them in with the almonds. Sprinkle with salt. Roast for 10 minutes, making sure to toss about half way through. In a large bowl, toss everything together and store in an air tight container for up to 3 weeks.